Wow! I'm really surprised. This was much more than I was hoping for. I thought it was going to be just a regular romance novel. This isn't one of those. It was awesome! There is a big flashback at the beginning of the book. I really liked this. It wasn't just a normal flash, going from past to present quickly. There was a nice long flash back. We find out what happened to Posey when she was younger that has shaped her who she is today. She was a girl in love and he broke her heart. They weren't even together. It is even worse than being broken up with! She's the unloved. How sad is that?! I really like Posey, she is quirky. She's got thick skin. She moves to the beat of her own drum. I like people like that. No matter what people say or do, Posey lets them know what she thinks. She doesn't let things shake her anymore. She doesn't want to open up much. No room for hurt that way. When her high school crush comes back into town she isn't sure how this is going to go. Does he even remember her? I like Liam too, even though there was much in his past--and present--that I didn't quite care for. He always made up for it. There were several scenes that I could not help but laugh out loud. The things Liam does to watch out for his daughter are down right hilarious. I think I might have died if he was my dad. I really enjoyed it! I've always loved stories with second chances. I think everyone should have a second chance, especially in love. If you want a clean quirky romance novel, then this is it! I feel all mushy inside now. I loved it so much that I've bought a few other Kristan Higgins books to enjoy! "Don't be nice to me," she whispered, though she didn't move away. "I might cry if you are." @Allison I totally loved it! 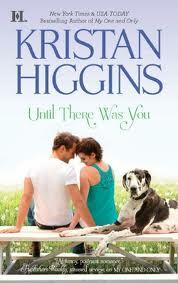 I've already picked up a few other books from Kristan Higgins and I just can't wait to get into them. I'm a new fan! I'm SO putting this way high on my TBR list - it looks FAB! !